October promises to be an exciting month for Scott Sharrard, the musical director and lead guitarist for the Gregg Allman Band. In addition to providing his continued support for the recent release of Gregg’s final studio album, Southern Blood, Scott will be making a series of October concert appearances in North Carolina and Georgia. On October 14th, Scott will lead the Gregg Allman Band – reunited for the first time in nearly a year – for a special appearance during the Laid Back Festival at Verizon Wireless Amphitheatre at Encore Park in Alpharetta. 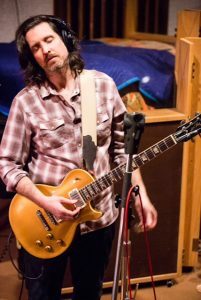 Ga. Gregg’s touring band, which backed the music legend on the recording of Southern Blood at FAME Studio’s in Muscle Shoals, will be joined on stage by Devon Allman, Gregg’s son. Scott, Devon and the GA Band will be performing Southern Blood in its entirety and they will also be doing some selected Allman favorites. Prior to the Laid Back Festival, Scott and his own Brickyard Band will be making their first-ever appearances in North Carolina and in Macon. Durham’s Blue Note Grill will be the location for the North Carolina show on October 11, while Macon’s Cox Capital Theater will play host to Scott and the Brickyard Band on October 12. Along with the live performance by the Brickyard Band, the Macon event will also be highlighted by the debut of a film featuring Scott performing an acoustic set of Gregg’s music. Filmed in an intimate club New York setting shortly after Gregg’s passing, Scott shares some of Gregg’s memorable works as well as stories from their 10 years of working together. The film was produced by Red Hawk Films, which has recently released the highly-acclaimed music documentary Sidemen, The Long Road To Glory. As noted in the headline, Scott will be available for interviews during the time leading up to the tour. We will be glad to work with digital, print and radio outlets to schedule interview time with Scott. From beginning his career in the Midwest and learning from legends like Hubert Sumlin to serving as Gregg Allman’s chief lieutenant for a decade, Scott’s held a front-row seat with some of the true greats in music. Interviewers find Q&A’s with Scott to be highly insightful and from the heart. If you would like to set up an interview with Scott or learn more about the upcoming tour, please contact us by clicking here.